October 19, 2018 – Amazing morning at Connecticut Audubon Society’s lower Smith Richardson Sanctuary in Westport today. The sheer numbers of sparrows were impressive. 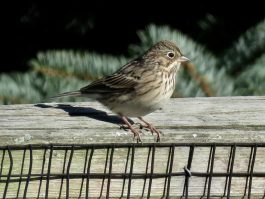 There were hundreds of Song Sparrows, a lot of White-throated Sparrows, many Swamp, a few Chipping, at least six White-crowned Sparrows, several Field Sparrows, three or four Vesper Sparrows, at least one Savannah, several Eastern Towhees, dozens of juncos plus at least three Indigo Buntings. Also seen was a Yellow-bellied Sapsucker, several Purple Finches and a few Pine Siskins (flyover). 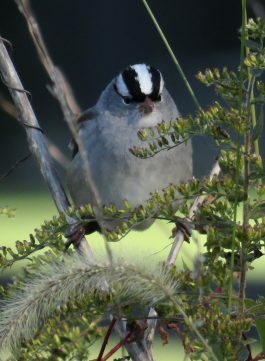 White-crowned Sparrow, by Patrick Comins. Bird Finder contributor Stefan Martin photographed a very plain looking “Solitary type” Vireo. He will need to examine the photos more closely, but it may be a good fit for Cassin’s Vireo. This was mostly between 9-10 a.m. The hot spot was at the sanctuary entrance at the end of the right of way just north of the junction of Hedley Farms Road and Sasco Creek Road. There is a Connecticut Audubon sign and a right of way between some houses. Please do not drive through the mud puddles. 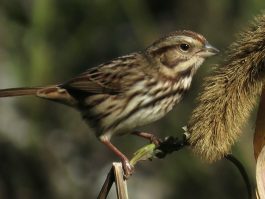 Song Sparrow eating foxtail millet, by Patrick Comins. The Connecticut Audubon Society, with funding from the National Fish and Wildlife Foundation’s Long Island Sound Futures Fund and additional support from Planet Fuel, Patagonia of Westport, Greens Farms Academy, Staples High School, Builders Without Borders, Forger and Kunkel Plumbing and many generous donors is in the midst of a $200,000-plus habitat restoration project at lower Smith Richardson. As part of the process we planted a cover crop of millet, sorghum and other grains to help keep invasives down, which has resulted in a para(sparrow-dise?) dise for seed eating birds and for birders this fall. We will be having a fall volunteer work day on Saturday, November 3rd to plant over 1,000 native trees and shrubs in pre-dug holes. Come help make this newly restored sanctuary a first class rest stop on the Atlantic Flyway and a great birding area for many years to come. The trees and shrubs are carefully selected for their value to migrant and wintering birds. We will be maintaining open areas for sparrows as part of the project and funds permitting plant ‘feed plots’ in future years as well. Vesper Sparrow. Photo by Patrick Comins.